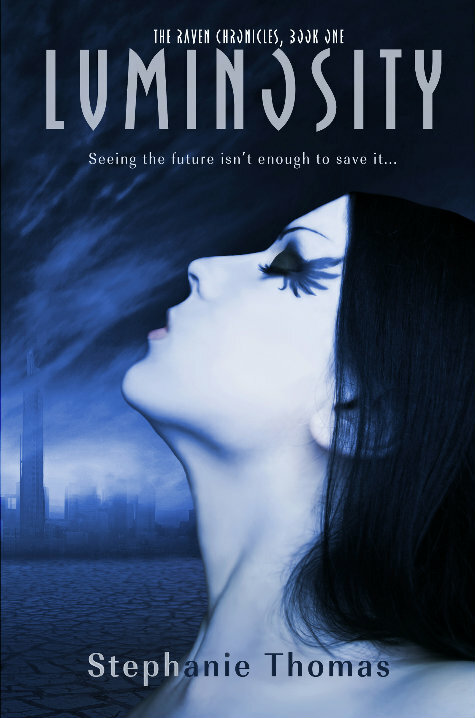 Dystopian fantasy novel, Luminosity by Stephanie Thomas, is the author's young adult debut. The main character, Beatrice, is a Seer who has been receiving visions of an impending invasion by City's mortal enemy, the Dreamcatchers. As tensions mount and the City goes on high alert, Beatrice starts keeping secrets that could be dangerous to everyone. Initially, I was not a fan of Luminosity. It is written in first person from Beatrice's point of view, and I was a little confused about the way Stephanie Thomas brought us into the story. For one, I thought Gabe was some sort of guard, and we're told the Keeper is supposed to be intimidated by Beatrice, but I never got that vibe. Despite these things, once I got into the novel, it really began to flow, and I was hooked. I'm usually disappointed in books that have romance as a major part of the novel because it comes at the cost of world-building, plotting, or character development. However, the romance in Luminosity was not overwhelming and watching Beatrice and Gabe was sweet, though very high school-esque. (Yes, I know this is aimed at a young adult audience.) The only thing I didn't really get was the "falling in love with the enemy" from the book's description. I never got any indication that Beatrice had feelings for anyone but Gabe. I mean, Gabe wasn't my favorite character in the book by a long shot, but at least I understood Beatrice's attraction to him. Luminosity is an average-length YA book, and I think it was perfect for the story told. The pacing of the novel was really good, and it was packed with action that was well-executed. I think teens will really be able to connect with the book and characters, and I told myself several times while reading it that it's written for teens without being dumbed down. Luminosity had a rocky start for me, but I was impressed by the end. I even look forward to rereading it in the future. Preorder Your Print Copy Today! Be sure to add it to your TBR pile on Goodreads! To satisfy FTC guidelines, I am disclosing that I received the book for reviewing purposes as a part of Itching for Books Blog Tours in exchange for an honest review. The advance digital copy was provided to the tour by the publisher, which has in no way affected the outcome of my review. All opinions expressed are rambling, honest, and completely my own. Nice review. Thanks for participating. Weren't feeling up to the extra long review this time? It's nice that the romance didn't overwhelm the plot. I am really, really sick of that and it seems to happen a lot in dystopian novels.